This Dvd teaches you the basics of cornrows. Discover step-by-step how to create cornrows your friends and clients will absolutely rave about! The tools you will need. 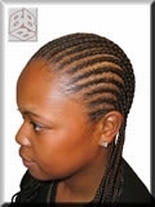 Want to know much more about different cornrows styles?